Can Satellite Broadband Support the Streaming Wave? Video is that largest consumer of bandwidth today and will increase exponentially over the long term –streaming video that is, not linear TV. As the industry moves from video in terms of cord-cutting to streaming data, the satellite play is still unclear when it comes to supporting services such as Netflix or Hulu. Today, there lies a huge opportunity given that fiber is required to support high-quality streaming, but it is by no means cost-effective to deploy and is hardly ubiquitous. Satellite, on the other hand, is ubiquitous but it is by no means cost-effective…at least not yet. A bit of background. Half of the global population continues to be unconnected, yet satellite is far from realizing its full potential, serving only a tiny portion of these users. Income availability is a tremendous barrier for many, but even in markets like Western Europe, satellite plays a minor role in the broadband technologies mix. The truth is that satellite broadband is still unable to meet mainstream subscriber expectations, being relegated to a last-resort tool. Perhaps most important, streaming time limits on satellite broadband hinders quality of experience. Given this limitation, what is the correct balance between price and streaming time that satisfies customer thirst for OTT platforms? Despite a slow last couple of years for satellite consumer broadband, long-term prospects continue to look impressive. According to NSR’s VSAT and Broadband Markets, 17th Edition report, the global installed base will reach close to 14 M subscribers by 2027. This trend will only materialize if satellite is able to meet subscriber expectations with more generous data caps, or what matters today, greater streaming time allowances. 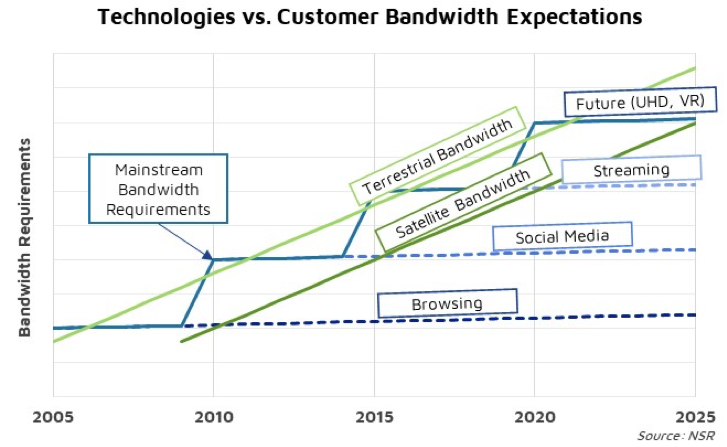 Mainstream bandwidth expectations evolve as new applications generate new requirements. While a couple of Mbps were previously enough for a good Web browsing experience, social media and video streaming need faster speeds and more generous data caps. Terrestrial technologies have been able to meet these new levels of performance. However, satellite lags behind as capacity costs make subscribers experience smaller traffic allowances. Today, a mid-range satellite Internet plan is able to satisfy users generating traffic from Web browsing and Social Media, but data caps are still too low to support multiple hours of streaming per day. Consequently, satellite is unable to engage the mainstream consumer, leading to slow take up rates and high levels of churn. CISCO’s VNI 2017-2022 reports IP video represents 75% of total IP traffic, and the consumption profile for a satellite subscriber is not very different from that. Consequently, the capacity to stream video is the primary driver for subscriber Quality of Experience. One could infer the “streaming time allowance” as satellite capacity prices vary. At capacity prices of $200 USD/Mbps/month, the plan for a $50-subscriber would be capped at ~10 GB, insufficient to satisfy today’s video-centric customers. 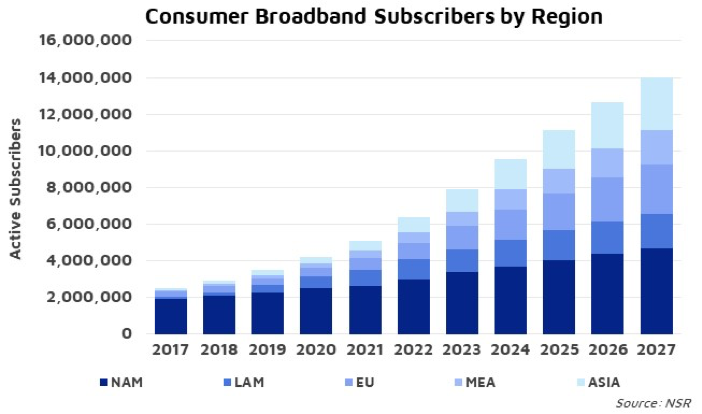 If the industry wants to unlock the potential of this market, capacity prices need to decline below the $100 USD/Mbps/month threshold, where data allowances could grow rapidly and boost subscriber satisfaction. A number of platforms are implementing tools to boost the “streaming time allowance” without incurring greater capacity costs. One common strategy is limiting video quality to 720p (or lower), giving much higher streaming time with the same data allowance compared with 1080p. However, with OTT now going beyond handhelds and conquering TVs, it is only a question of time before this starts harming subscribers’ perceived experience. The main factor dragging growth for satellite broadband is neither the lack of addressable market nor the low-income availability in some regions; it is the challenges it continues to have meeting customer expectations. The mainstream Internet user of today wants to be able to stream multiple hours of video daily. However, the balance between customer willingness to pay and current satellite capacity prices do not match to offer data caps that support this. If the industry wants to unlock opportunities in this massive market, satellite capacity prices need to decline below the $100 USD/Mbps/month benchmark for “streaming time allowances” to grow to meet subscriber expectations. 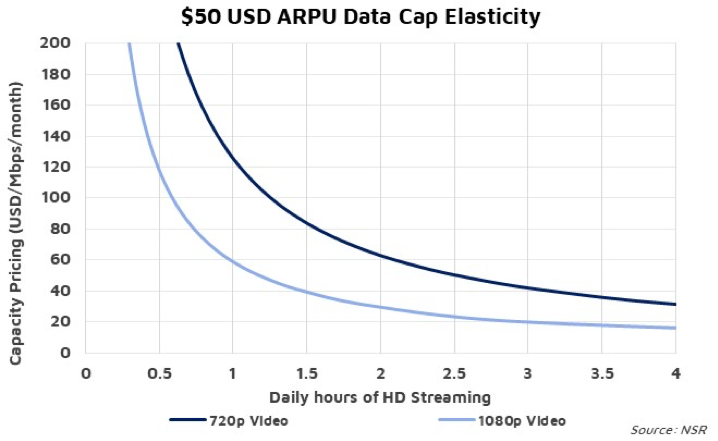 There are other technical, financial and market considerations but at a minimum, satellite bandwidth needs to overcome the $100/Mbps capacity price threshold in order to catch the video streaming wave. Of course, this is easier said than done. Operators are already struggling with price pressure that have led to huge challenges not just in closing the business case on specific verticals but are struggling as well in the most basic and core business element of satisfying shareholder expectations. Yet, as we’ve seen in the past few years, price reductions have been inevitable as simple supply/demand principles have caused the equilibrium or market price to decline. Going forward, more supply is coming, so prices will decline even further. As such, embracing lower capacity prices, which will be inevitable, and crafting a video streaming strategy around lower price points will enable the industry to catch the wave.